Confession of a *wannabe* foodie… these taste amazingly similar to the original Little Debbie Oatmeal Cream Pies, yet oh so delicious! Line 2 large cookie sheets with silicone baking mats. In a medium bowl, sift together flour, salt, baking soda, and cinnamon and set aside. In a large mixing bowl, beat butter, brown sugar, and sugar until fluffy. Add molasses, vanilla, and eggs and beat until well mixed. On low speed, gradually add the flour mixture to the butter mixture and beat until just combined. Drop cookies by rounded Tablespoons onto a baking sheet, providing plenty of space between each cookie as they will spread. I use a small ice cream scoop or cookie scoop to assure that all cookies are the same size. Bake cookies for 10-12 minutes until they begin to brown. 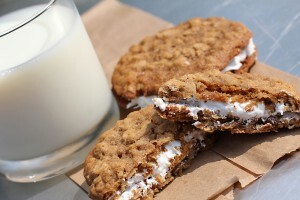 Do not over bake, to keep your cookies soft and chewy for your oatmeal cream pies! While the cookies are baking, prepare the cream filling. Dissolve the salt in the hot water and set aside. In a large mixing bowl, beat together marshmallow cream, shortening, powdered sugar, and vanilla until light and fluffy. Once the mixture is light and fluffy, beat in the cooled salted water. Spread the desired amount of cream filling on the flat side of one cookie and top with a second cookie. Capital! As usual the dynamic duo on the side of the hill in U-City has created a culinary and photographic masterpiece. I think these may fit in an envelope, yes? If so I beg of you to do the right thing and slip one in the post.